The Perfect Pack makes a return in the Hundred series! 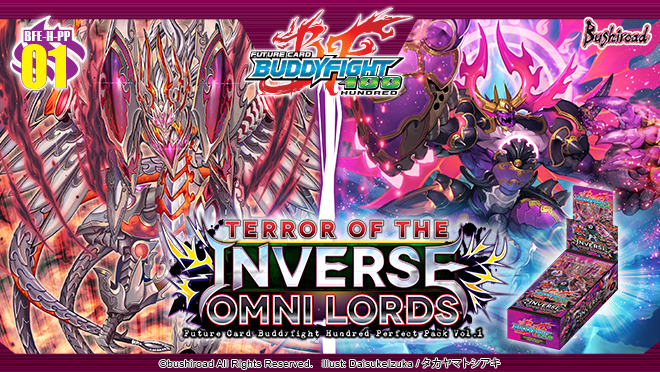 Born from Yamigedo, the savage Inverse Omni Lords are out to terrorize! But all hope is not lost… a mysterious savior helps fight against the Inverse Omni Lords!! 9 different Omni Lords RRRs, within your grasp! Gear up to fend them off, or if you can’t beat them, why not join them? This product contains cards from all worlds including the 《Hundred Demons》 attribute! 3 PR flag cards will be randomly inserted into each display (12 types of flags in total)! Flags of all worlds, including Dragon Ein and Parade of Hundred Demons, will be included! Every pack will definitely have one R, and an additional R or above! There are no common cards in this set! Parallel foils of Uncommon and Rare Cards are randomly inserted in packs!